BPA FREE SILICONE – Electric Hot Air Popcorn Poppers and Popcorn Machine constantly break down. 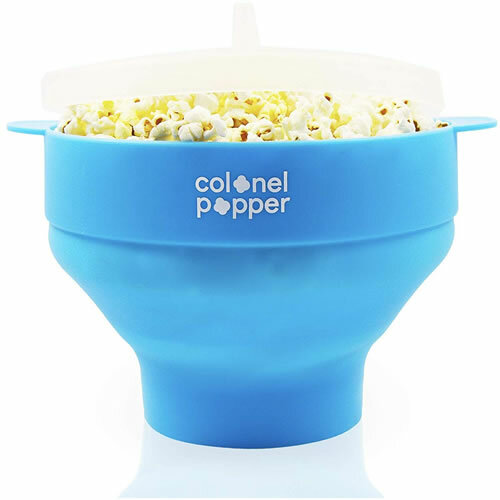 Our Silicone Popcorn Popper is super durable, safe, and eco-friendly. You can eat fresh microwave popcorn right out of the colorful popcorn bowl! USE ANY POPCORN KERNELS – Bring the theater home and use any corn kernels or popcorn oil. BPA Free Silicone Microwave Popcorn Popper makes up to 14 cups of popcorn, plenty for your kids and family. Healthier option than Microwave Popcorn Bags. CONVENIENT GRAB HANDLES – Revolutionary Air Popper Popcorn Maker allows you to toss popcorn salt or seasoning to mix well and conveniently grab from the regular or convection microwave oven. DISHWASHER SAFE – Hand wash or use dishwasher. Popcorn microwave maker instructions included.